A key aspect of kiteboarding is matching the right wind conditions with appropriate kite size, board size, skill level, and body weight. Newer kiteboarders often scratch their heads about the minimum amount of wind they need and whether the conditions on a given day will allow them to ride or even fly a kite. So how much wind is actually needed for someone to kiteboard? Although there are quite a few factors involved, the short answer is that an average level kiteboarder weighing around 175 lb needs a relatively constant minimum wind of 12 knots to be able to actually ride with a 11 -12m2 kite and on a 140- 145 cm size twintip board. In this post, I’ll go through each of these aspects and look at how they affect the minimum amount of wind you need for kitesurfing. An average size kiter (around 165 lb) is usually able to fly a 11 or 12m2 kite starting at about 10 knots of constant wind. Note that I’m talking here about flying not riding – see below. The smaller the kite you have available, the more wind you’ll need to be able to launch the kite and keep it up in the air. The shape of your kite also plays a key role. A hybrid kite typically will have a lower wind range than a C-kite. So while you can fly a North Evo or a Cabrinha Switchblade in as little as 10 knots (assuming no lulls), it will be much harder to do with a Slingshot Octane (C-kite). Keep in mind that each kite model has a different wind range by size. Generally speaking, though, you need about 1.5 extra knot of wind for each m2 drop in your kite size. You will sometimes see people flying a 14, 15, or even 17m2 kite in lighter winds. Although it can work, kites with a bigger surface are heavier and slower moving, and flying them requires more skills. Many kiteboarders (including myself) don’t find it enjoyable to fly such huge kites – aside from foil kites, but that’s a different story. That’s why 10 knots is often considered the minimum wind speed for flying a kitesurf kite. So far I’ve talked about how much wind you need to fly your kite, i.e. launch the kite, get it moving around in the window, power it up, and practice getting dragged in the sand. Again, you can achieve this goal with a 12-13m2 hybrid kite starting around 10 knots of wind. This amount of minimum wind may also be sufficient for body dragging in the water. The combination of your body weight (plus added weight from your wetsuit, vest, helmet) and immersion in the water, however, creates strong anchoring, so you’ll need to throw your kite harder than on the sand to boost yourself. While 10 knots of wind gives you a mellow drag on the beach or in the water, if your objective is to actually ride you’ll typically need at least 13 knots to pull you out of the water and start moving on your board, all other things being held equal (your weight, kite size etc). Riding upwind requires an even stronger minimum wind for an average size kitesurfer on a 11-12m2 hybrid kite. You’ll typically have a hard time staying upwind with less than 15 knots – a sweet spot for that size kite. A larger board, a lighter rider, and/or better skills can lower this threshold, though. Your weigh is an essential factor in determining how much minimum wind you need to kiteboard. The heavier you are, the more kite surface or the higher the minimum wind you need for riding. Conversely, the less you weigh, the less wind is required to ride the same kite. As a rule of thumb, you need roughly 1 extra knot of wind for every 10 pounds extra weight. To ride a 12m2 kite in wind below 12 knots, let alone staying upwind, you would need to be really lightweight – e.g. a smaller female rider. At 180 lb I don’t even bother going out with my 12m2 kite (my biggest kite) when the wind is less than a constant 14 – 15 knots. Foil kites, again, are an exception, they are a different beast with a much lower wind range but lack some of the capabilities of regular kitesurfing kites. Board size also greatly impacts the minimum wind you need to kiteboard. When I mentioned an average rider being able to ride upwind starting at 15 knots with a 12m2 kite, that was assuming an “all-round” twintip 140 cm to 145 cm in length. Twintip board sizes, like for snowboards, are expressed as a number of cm which refers to the board length. What really matters, though, is the total surface, so width is also important. A twintip board needs speed to float when you stand on it – when still it can only float its own weight. The larger the board surface, the sooner the board starts traveling fast enough so that water pressure can lift your weight, and the longer it will keep planing. Therefore, you can start riding on a bigger board with less pull from your kite, i.e. with less wind. Unlike kite sizes, there are few board-size-to-wind-range charts around. From my own experience, I found I can typically start riding in winds 1 knot lighter (assuming a minimum of 12 knots) by using a twintip board 5cm longer / 2cm wider. So for example, assuming you have a 135 x 40 board for going fast and jumping, and a bigger board 142 x 43 beginner / light wind board, you may be able to ride upwind with a 9m2 kite starting at 17-18 knots with the bigger board vs 19-20 knots with the smaller one. Aside from wind speed, wind steadiness and direction also affect how much wind you need to kitesurf. If you measure 15 knots on your anemometer but you see big lulls at under 10 knots then you should probably avoid going out. Even in stronger winds, wind lulls can make it very hard to stay upwind unless you have strong skills. Each time you go through a wind drop, you have to stop edging and drift downwind for the duration of the lull in order to avoid losing all speed and sinking in the water. 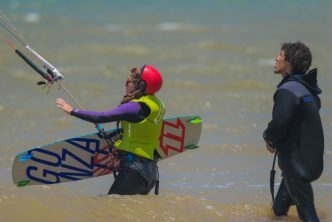 If the lull is significant and long-lasting, you even face the risk of your kite stalling or dropping into the water if you don’t know how to handle it. How well your kite holds up in lulls depends not only on kite size but on the kite’s specific shape and capabilities. For example, a Cabrinha Switchblade will hold up way better in a lull than a Drifter, and a Duotone Neo than a Rebel. How constant the wind is may also depend on wind direction, e.g. whether it’s blowing from the sea or from the land, and whether there are high obstacles such as mountains or buildings. In one area I ride in, for example, offshore winds are known for being strong and very gusty with huge drops, while cross-shore / onshore winds are lighter but steadier – though rain-ridden. When I was still learning, I couldn’t believe it when I saw some riders about the same size as me going out with a 7m2 and riding upwind effortlessly while more kiteboarders were struggling and walking back upwind with their 10m2. Similarly, some experienced kitesurfers will go out in 12-13 knots with a 11m2 kite and have a great session with no beach walking at all, while most kitesurfers stay on the beach or pump up a 15m2 monster kite. Light wind (aka small size) riding is very technical and requires a stronger skill set than riding powered up. You need to find just the right amount of edging pressure on your board and the right kite position in the window for staying upwind without losing power. Beginners will typically dive their kite as soon as they feel the slightest drop in wind. Diving the kite fast into the power zone gives you a temporary boost, however, the kite will then often stall and lose all power, making you grind to a halt. Throwing the kite in the window is not always the best response to a drop in wind and power. Overflying is just one example of things to avoid in low wind conditions. You need to learn to avoid getting stuck at the edge of the window (not being able to get the kite into the power zone) and stalling. Relaunching in light wind can also be very challenging. For many newer kiteboarders, riding in light wind is more pain than pleasure. They don’t find it worthwhile as they keep drifting downwind and have to walk back each time around, or they keep dropping their kite into the water and are unable to relaunch it. Nevertheless, you learn a lot by riding in light wind conditions -it can really boost your skills by mastering these techniques. 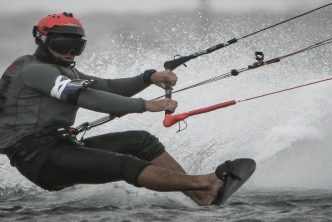 Another point I want to mention regarding the minimum amount of wind you need to go out kiteboarding is sea conditions. All the factors we’ve seen so far assumed flat water riding conditions, e.g. in a lagoon, estuary or calm sea with no surf. Riding in choppy water or in waves, however, requires more power from your kite to get you over these humps and/or waves. My experience is that you typically need at least an extra knot of wind when riding in small waves. In light wind, even small ripples can make the balance tip and keep you from riding back to the same point you started from on the beach. It’s even more dramatic in bigger waves: not only do I need more pull from my kite to go over them, but I often find myself going through lulls as I get close to the waves – not sure about the physics of it but it happens to me all the time. Having your kite stall and your board stop and sink as a wave is coming onto you can be scary! So while I’ll typically go out on my 9m2 starting at around 18 steady knots, if the surf is big I may play if safe and set up an 11m2 so as to not run out of juice at the most critical moment when getting close to the wave – even though I may get a bit overpowered at times. You typically need much less wind when riding a surfboard vs a twintip board – assuming you master the skills for it. Surfboards (or kitesurfboards) generally have much more buoyancy than regular twintips and can start lifting you above the water with much less power. This boils down to the same considerations as for twintips: the more floating surface, the less minimum wind needed. That’s one of the things I personally love about riding a surfboard: you can often get by with less wind (a couple of knots) or smaller kite (e.g. 2-3 m2 smaller). Of course, there are surfboards of all shapes and sizes – high wind vs light wind surfboards, offshore vs onshore etc. Each board will have a different wind range taking into account rider weight and kite size. So the equation is just as complex as for twintips. Another key factor is whether you’re riding strapped or strapless. When strapless your feet are not locked in so you have to stand upright much more and lean less than when strapped – sort of like riding a skateboard. Thus, you want less pull in your kite so as not to get pulled over the edge of the board. Strapless riders thus prefer to be underpowered (within a limit) than fully powered, whereas strapped kitesurfers like to have more power namely for carving hard and jumping. As a result, a strapless rider might start going out in winds 1 or 2 knots lower than a strapped kiter with the same kite size. All this talk about how much minimum wind you need to riding is nice and all, but how do you actually assess wind speed? For many beginner kiteboarders, the easiest way is just to pull out a wind meter (anemometer) – such as the popular Skywatch Xplorer (Amazon page), get a couple of readings, and go by the book in choosing kite size – e.g. using the kite manufacturer’s wind chart. Measuring the wind with a meter is a good idea, but you should not rely solely on these numbers for deciding whether to go out and which gear to use. For one thing, measurements will often vary depending from one meter to the other. Even assuming you have a reliable wind speed number, factoring in all the things we’ve talked about in this article to make the right decision for you will require a lot of practice. So what should you do when you’re still new to kiteboarding? Force 3 Gentle Breeze. 7-10 knots (8-12mph) Out on your SUP or foil kiting. Family sits on shore eating sandwiches and wait. Force 4 Moderate Breeze. 11-16 knots (13-17 mph) Kite instructor has student in the water. It's enough to relaunch, body drag, but not enough to hurt yourself if you do an unintentional kiteloop. You open up your root beer and wait for some more wind. Force 5 Fresh breeze. 17-21 knots (18-24 mph) Finally the wind is here. Conditions are perfect to try new tricks and get some small jumps in, crashes don't hurt. Force 6 Strong breeze. 22-27 knots (25-30 mph) Everyone gets out a smaller kite. People start landing the huge jumps. Noobs are told to be careful, might be too much wind for them. Crashes start to be painful. Force 8 Gale. 34-40 knots (39-46 mph) Kitesurfing rock star pumps up his kite and everyone else watches from shore. There is no 9, 10, 11, 12, kitesurfing for fun ends at force 8. The other crucial thing you should do is to observe and talk to other kitesurfers on the beach to learn about what size they’re setting up. Then you can adjust your own size choice based on weight and board size differences between you and them. So if someone your size is pumping up 9m2, chances are that size will work for you – unless the person is much more experienced or has a significantly smaller / bigger board. Also, observe the riders already on the water and see if they seem to be riding easily without diving their kite too much. Try to make out which size kite they’re using – many brands have the size printed in big characters on the kites so others can see it from the beach. If you like more accuracy, you can use your wind meter as a reference over time – not relying on the absolute numbers but comparing the current readings with previous days. Over time, combining the relative numbers, the information from other riders, and your own experience, you’ll start to make increasingly accurate wind assessments and choices. Determining how much wind you need to kitesurf can be tricky as it involves a lot of different moving parts including kite and board type and size, rider weight, wind and sea conditions, experience level and flying objectives. As you progress in the sport, you will build up skills, change gear, discover new kitesurf spots with different wind situations, get into specific riding styles such as tricks or wave riding, etc. As a result, your idea of the minimum wind to look for when going out kitesurfing will also evolve. Meanwhile, you’ll keep getting better at evaluating wind speed and conditions based on both your own, and other kitesurfers’, accumulated experience over time. Can Anyone Learn to Kitesurf ? What Are The Best Kiteboarding Kites for Beginners?